Toshiba's RC100 has arrived as the company's first low-end retail NVMe SSD, and only their second retail NVMe SSD after the aging OCZ RD400. There's nothing else quite like the RC100 in the retail SSD market, but it is part of a broader trend of PCIe and NVMe interfaces being used for cheaper SSDs, and not just the high-end drives that all the first-generation NVMe products aspired to be. Prices on these entry-level NVMe SSDs are now encroaching on the SATA SSDs that still make up the bulk of the market. 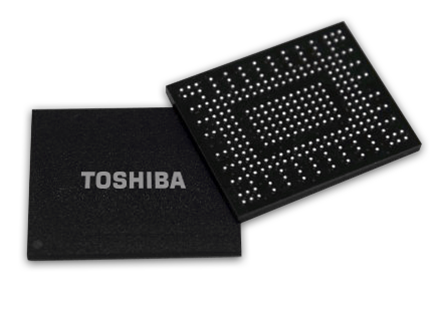 The RC100 is descended from Toshiba's line of Ball Grid Array (BGA) SSDs for the OEM market. These drives stack the SSD controller and NAND flash memory dies in a single BGA package, making them suitable for small form factor systems that might otherwise use eMMC. Toshiba has also been mounting their BG series SSDs on M.2 2230 cards for OEMs that require upgradable storage devices. The Toshiba RC100 is based on the BG3 SSD, and the primary change in making a retail version is that the M.2 card has been lengthened to 42mm because relatively few existing systems support 30mm M.2 SSDs. This is still quite a bit shorter than the usual 80mm card length used by most consumer M.2 SSDs. Toshiba's first NVMe BGA SSD was the BG1 introduced in 2015. It used 15nm planar MLC NAND and a 16x20mm package with a PCIe 2 x2 interface. The next generation BG2 was the first client drive to ship with Toshiba's 3D NAND flash memory, but it used their 48-layer design that was never competitive enough for a retail SSD. The BG3 was announced last year as part of Toshiba's transition to their 64-layer 3D NAND that is finally good enough to fully displace their planar NAND. The small physical size of BGA SSDs limits both the width of their host interface (to two PCIe lanes instead of the four used by high-end NVMe SSDs) and the amount of memory they have. Toshiba's BG1 only offered 128GB and 256GB capacities, and the BG2 and BG3 only go up to 512GB. Toshiba's BG series and the RC100 also don't have a DRAM die in the stack, so these are DRAMless SSDs, and as we'll see can definitely behave like one. Meanwhile thermal throttling is usually not a concern for BGA SSDs because they don't offer the same performance as high-end NVMe SSDs, and consequently only use 2-3W under load instead of the 5-8W used by larger high-end M.2 SSDs. To mitigate the performance limitations that result from not having a DRAM cache, Toshiba's BG2 introduced support for the NVMe Host Memory Buffer (HMB) feature, and that has been carried over to the BG3 and RC100. HMB is an optional feature that was added in version 1.2 of the NVMe specification, released in 2014. Though the feature was standardized years ago, adoption has been slow because there hasn't been much of a market for low-end NVMe SSDs in either the retail or OEM channels, and Microsoft's NVMe driver didn't implement HMB support until the Windows 10 Anniversary Update in 2016. 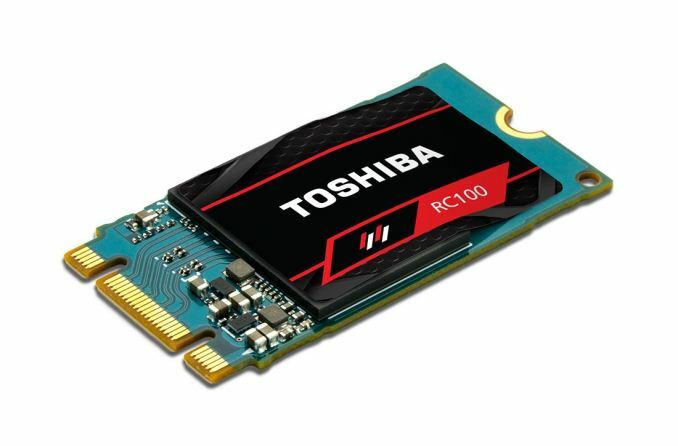 The Toshiba RC100 is available in capacities from 120GB to 480GB, essentially the same as the BG3 but with more spare area reserved to allow for slightly higher performance than the BG3. Sequential transfer speeds are rated to be several times faster than a SATA drive, while random access performance is only a bit higher than SATA drives—the flash itself is more of a bottleneck for random IO than the host interface, especially on a DRAMless SSD. The RC100 comes with a three year warranty and its write endurance rating is about 0.45 drive writes per day (DWPD) for that time span, so it's a bit behind the mainstream and high-end consumer drives that are usually rated for 0.3 DWPD over a five year span. The active power rating of 3.2W is much lower than most of the NVMe SSDs we've tested, and is more in line with SATA SSDs. Idle power is rated at 5 mW, but this is only on platforms with properly working PCIe power management, which doesn't include most desktops. The lack of DRAM and the narrower PCIe link both help keep power consumption low, but the performance impact of those limitations may prevent the overall efficiency from breaking out of the general pattern of NVMe SSDs being less efficient than SATA SSDs. The RC100 uses the single-sided 22x42mm M.2 card form factor with notches in both the B and M positions because it only uses two PCIe lanes instead of four. This means it's mechanically compatible with M.2 slots that may only provide SATA signals. On the card itself, we find a little bit of power regulation circuitry to provide 1.2V and 1.8V from the 3.3V supply, the BGA SSD itself in a 16x20mm package, and enough empty space for the card to reach the first mounting hole on most motherboards. 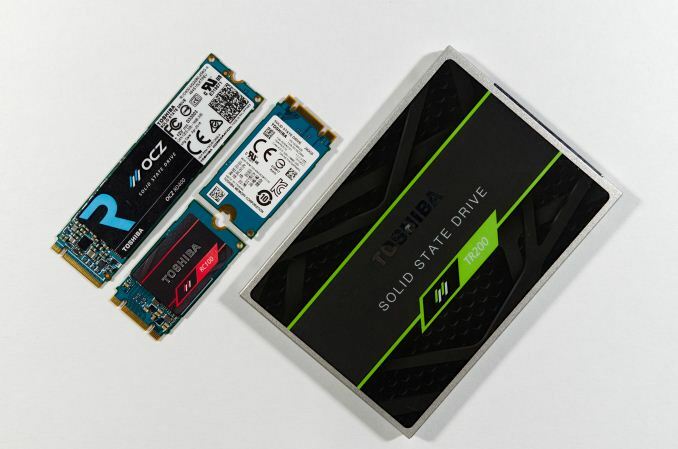 The Toshiba RC100 essentially has no direct competition in the retail SSD market: M.2 2242 PCIe SSDs have been almost impossible to find until now, and even M.2 SATA SSDs in this form factor are rare. But systems that require these shorter M.2 cards instead of the more common 80mm length are also rare. The closest competitors to the RC100 are other recent low-end NVMe SSDs based on either the Phison E8 controller or Silicon Motion SM2263, or their respective DRAMless variants (E8T and SM2263XT) that also use the NVMe HMB feature. We've reviewed the MyDigitalSSD SBX with the Phison E8 controller and have several more reviews on the way for this product segment. With this review, we are finally switching entirely to test results gathered on a system with Meltdown and Spectre patches, current as of May 2018. We have not yet re-tested every drive in our sample collection, so the comparison results in this review don't always show every relevant drive.